Looking at the Chinese mobile market today reminds me a lot of looking at the Japanese model in 2000 or 2001 - lots of very interesting stuff is going on, but getting reliable data is very tough. One triangulation point comes from app analytics platforms. You need to have some caution as to how representative they are, but the big ones give a good directional steer. Umeng (think Flurry for China) is one of the biggest. It puts out statistical reports every quarter or so - these are some of the key charts in the latest. First, platform size - this is their estimate of active devices that are using apps (not total devices), including tablets. Both iOS and Android are growing fast, and Android faster, as one would expect given the range of prices that Android devices are offered at. 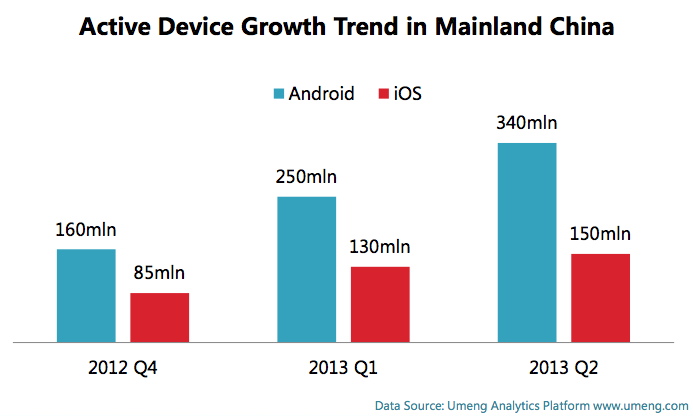 However, on this data there are probably more iOS devices in China than smartphones in the USA. Second, handset brands. Apple is the largest single brand in this data set, but shrinking. This of course is users, not ongoing sales, so some recent suggestions that (for example) Xiaomi outsold iPhone in the run-up to the iPhone launch may be compatible with this. Finally, and perhaps most interestingly, a window into the state of Android in China. As most people know, the great majority of Android devices sold in China are built on AOSP and have no Android services pre-installed (indeed, I've used a Motorola phone with no Google services present) - instead they have a range of apps from the local internet giants. This means that most Android phones have no Gmail, Google Now, Google Maps or, of course, Google Play, and most apps are installed form third party app stores or side loaded, either pirated or downloaded directly from publishers' sites. Some handsets do have these, either because people added them afterwards (which is not easy) or because they're using grey market imports. Estimates of the total with Google apps on them are mostly in the 20-30% range. However, on Umeng's data, Google Play amounts to just 5.6% of Android app installs in China. OEM app stores are 8.5%. This, for example, is why Baidu paid $1.8bn to buy a couple of app stores earlier this year.